While there are care providers who may mislead you about your risks, benefits, and options, this article is written assuming that you are meeting with an ethical care provider who supports the option of VBAC. Read more on how to find a providers like this. If you are a good candidate for VBAC, the single most important decision you can make that will have the greatest impact on your chances of VBAC success is who you hire to attend your birth. This is why it’s important to interview several care providers and ask specific questions. You will often receive different information when speaking to the doctor or midwife directly than you would from the people who answer their phones. When calling their office, be sure to state that you want to have a consultation. Ideally, you want to meet in an office, not in an exam room. The key to all of these questions is that they are open ended. The trick is to ask the question and then sit back and really listen. What is your philosophy on planned VBACs? What is your philosophy on planned VBACs going past 40 weeks? What is your philosophy on suspected “big babies” (macrosomia) among planned VBACs? How many VBACs have you attended? Of the last 10 planned VBACs you attended, how many had a VBAC? What is your philosophy on inducing VBACs? What is your philosophy on monitoring planned VBACs? Does your hospital have telemetry (wireless monitoring)? How often is it used? What is your philosophy on waters being broken for more than 24 hours? How long do you think it’s safe for VBACs to labor? What is your philosophy on epidurals in planned VBACs? What are your standing orders for planned VBACs and do they differ from your standing orders for first time parents? How does your on-call schedule work? What are your thoughts on movement during labor and delivery positions? What is your philosophy on IV or saline lock? Do you offer family-friendly cesareans? Do you attend vaginal breech births? If not, can you refer me to a provider who does? Do you attend vaginal twin VBACs? Do you attend VBAC after 2 cesareans? Do you attend VBACs with a classical (high vertical), T, or J scar? Do you attend VBACs with a low vertical or unknown scar? Ok, you have your list of questions… what now? Knowing what questions to ask is just one part of the process. How to do you know what answers to look for? Well, that’s the next step. In order to know how the answers you receive line up with the evidence, you have to actually know what the evidence says. And most parents and professionals don’t have the time or interest to dive into the research. Or the process feels overwhelming so they don’t take the first step. In my online trainings for parents and professionals, I’ve done all the work for you. I translate the evidence on each question so you know how to decode the provider’s response as well as red flags to avoid. Once I find a vbac supportive provider, how do I handle the possibility of a different OB being on call during my delivery? Do I need to meet with all OBs in the practice to ensure they will all be on board? Also, how do I navigate if my OB is supportive of VBAC but the hospital where she delivers has restrictive VBAC guidelines? I had my first son 5/5/16 via C-section after 31 hours of induced labor (including an epidural) and 2.5 hours of pushing. He was not descending, and I got to the point that I didn’t feel like pushing was getting me anywhere (plus I couldn’t feel anything!). The OB offered to use the vacuum or do a C-Section. I’ve heard so many horror stories about the vacuum that I opted for the surgery. While she was operating, she told me that my pelvic structure is too small and that I’ll always have to have C-sections. Now I’m pregnant with our second child and I really would like to do a VBAC…but is it too soon, and does what my old OB said disqualify me? Thank you so much for sharing these questions, will definitely be using this list to find our next dr. I have had 2 previous c-sections. First one was at 39 weeks (went in because we were first timers and I panicked thinking I wasn’t feeling the baby move!) so my dr told me to go get monitored, she decided to induce me because “supposedly” the baby wasn’t moving too much (I feel like she rushed me, because she was going to be out of town the week I was actually supposed to be due… so she just wanted to get it “done”) Clearly my body was’nt ready, so i semi-labored for 14-17 hrs, then she rushed me to emergency c-sec because baby’s heart rate was dropping as they were increasing the pitocin. Then my second pregnancy (same dr), from the beginning I had told her that it was REALLY important to me that we give it our BEST shot, and I want to have a VBAC. She “seemed” on-board, but I feel like that was all an act. My water actually BROKE at 40 weeks, I labored for 12+ hours… the nurse actually pressured me into getting an epidural (even though I kept saying no… she kept asking me, and silly me gave in and got it… which i wish I hadn’t) after 12+ hours the dr comes in and says I need to get an emergency csection because baby’s heart rate is dropping. (and yet again… this dr was going to be out of town yet AGAIN the following day… so I feel like she again rushed me for no good reason). After me begging her to give me more time, i was actually fully dilated towards the end when she came over and told me i needed a csec; I told her can i pleaaaase try to push… her exact words were “fine, i’ll give you 15mins with the nurse, you can TRY to push. But after that you’re going to get a csection) 🙁 since i had the epidural… i couldn’t feel my legs or the urge to push… so that never really got anywhere, and we ended up rushing to get a csection done. NOW… we’re not pregnant yet, but I want to do my research and be properly ready in hopes of having a VBA2C. Do you think I could possibly have a chance at having a successful vba2c? Especially since with the last pregnancy my water broke naturally, and I did dialte 10cm before the stupid dr rushed me into getting a csec?! I’m in the NW Suburbs of Illinois. I switched from my old OB-Gyn to a new one… I asked her if she allowed vbacs, her exact response was… “it will depend on what the exact reason was for my previous csections, and what the previous dr found while performing the csection. if my old dr gives an ok to try a vbac then she will go ahead with it.. OR will give me her recommendations… in the end the decision will be my own” –not sure if this dr was just saying it to get my business OR she actually meant it. :\ Will be visiting another OB in couple of weeks to see what she says. Congratulations on getting your ducks in a row before you get pregnant again! I think knowing who your provider will be, and getting an idea of the birth you want to plan before you conceive, will enable you to enter your pregnancy with happiness and peace. There are a lot of things to consider when planning a VBA2C which easier to discuss over the phone than via typing. I’d be happy to share my thoughts with you. Click here for more information on how to schedule a call with me. I too would like advice on planning a VBA2C. We are not pregnant yet and would like some advice. I highly encourage parents to learn as much as they can before they interview providers. Walking into that room educated means that you can confidently discuss your options and feel a sense of control as you can speak the language. There are a couple different ways for you to learn. A lot of parents start googling or go to message boards. This can be time consuming and it’s up to you to sift through misinformation. That can be quite challenging. That is why I created my online courses for parents. They give you a personal tour through the evidence and you don’t have to wonder “what’s the other side of the discussion?” I give it to you. If you have a list of questions that you just want to knock out, you can schedule a call with me and we can go through them one by one. I just read the interesting information you have posted in regards to VBACS. Since I have had 2 Previous csections. My 1st was due to babies heart rate dropping and 2nd I attempted a VBAC I was only in the hospital for 2 hours and I only dilated 2cms, and i was rushed for a c section as the doctor had rushed in to check me and said I was ” too tight and too narrow” I presume he meant my pelvis bone! Despite the fact babies heart rate was perfectly fine, My waters had not broken they didnt allow me to move and I was bed ridden. I do feel I was not given enough time and rushed by the surgeon. The hospital does allows VBAC after 2 sections, however it depends on the reason why you required the previous csections. Do you suggest I ask for a pelvis check to see if I am too narrow? I have read a lot of successful stories about Narrow Pelvis bone and women delivering naturally. I think it’s always a good idea to meet with VBAC supportive providers in your area and get their opinion. In terms of getting your pelvis checked, consider what you would do with the information. Would it give you peace of mind or stress you out? I recommend asking your provider what they think. If you have a “less optimal” pelvic shape, what do they recommend? You may even want to get this information and then talk to a few providers in your area to see what they say. As you may know, there is a wide range in how doctors and midwives practice… and not all of them are consistent with national guidelines or the medical evidence. So, collect your information, interview providers, and then weigh your options! I had my first son via c-section on 06/06/2015. I found out I am pregnant with my second baby in July of this year (2016). When I had my first c-section, I was induced at 40 weeks and 2 days. I was unable to get passed 3 cm dilated when my sons heart rate started dropping so I had to get a c-section. Everything else in my pregnancy was completely normal. I did not get an epidural until I was told I would be getting a c-section. Wondering if I would be eligible for a VBAC? 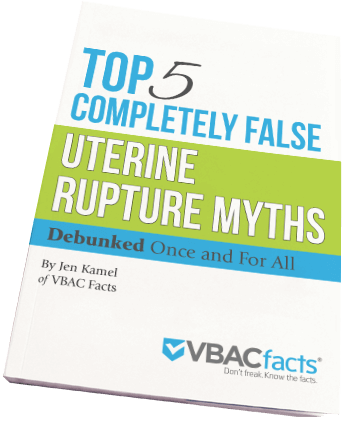 Most women with one prior cesarean are candidates for VBAC and it’s very likely you are too. Your best bet is to meet with a VBAC supportive doctor or midwife, have them review your operative report from your cesarean, and talk about the risks and benefits for you. If you haven’t already, download my VBAC planning checklist. I have three boys, 4, 2 and 13 months. The first and third were emergency c-sections and the middle child was a successful VBAC. Everyone is telling me that I can’t have anymore vbacs because of my second c-section. I’m hopeful that isn’t the answer. But I still want to be safe and have my baby be safe. Our first was a emergency c-section because he was too big and he failed to descend. The third was emergency because of placenta abruption. In both cases, I understand if I hadn’t of done the c-section, I or my babies wouldn’t be here today. So, you can see my concern for maybe trying for another VBAC…. But its finding a doctor who will let me as well. What’s your insight? I’m hoping for a VBA2C next time, but i want to be as prepared as I can be before that time comes….Emotionally, Mentally and Physically. 1. Oct. 2011 Emergency c-section after 27 hours of laboring and 4 hours of pushing. He “failed to descend”. He was 9lbs 11.5oz 22 inches long. 2. Sept. 2013 VBAC. I was induced around 7am and he arrived around 5pm. I pushed for about 3 hours. No assistance needed. Had an epidural. He was 9lbs 12oz. 21.5 inches long . 3. June 2015 emergency c-section. Began labor on my own this time. Everything was perfect! Until…. I got my epidural and I started feeling sick… they looked at his heart rate… shot me with KETAMINE…. ( yeah….) and did the section. Game over. They said the placenta was beginning to tear away from the uterus. Wanting another VBAC. Do you prepare physically??? I was doing 100 sit ups a day right before my VBAC. Maybe I was better fit for labor??? Thoughts…. I’m in Roy, Utah. Does anyone know of anyone or anywhere that would take me??? Some women with two prior cesareans are candidates for VBA2C per the American College of OB/GYNs. And women with a prior vaginal delivery are considered really good candidates. So unless there is something that risks you out (consult with a medical provider), you should be good! I’ve posted your question on my Facebook page to see if any of my readers know of any doctors or midwives. Are you able to travel? If so, you have a ton of options. I had my son c section induced at 39 weeks. he was 9lbs. I stopped dilating at 4 and that is why I had a c section. My platelets were low throughout my pregnancy and that was the only complication I had. If I was to not be induced 18 months apart from my c section didn’t get the epidural till the very last minute and made sure I could walk around good. do you think that I could do a vbac? I’d really like a natural birth and I think that if my doctor would have gave me time I could have had him natural. What are my chances in having a successful vbac? I posted your comment here to get more feedback. You are also welcome to join the VBAC Facts Community. I have had 2 c-sections already. Can anyone tell me if I may have a chance at doing a VBAC still? Yes, you can still have a VBAC, but you will likely have to search for a provider who is willing to attend you. What you are seeking is called a VBA2C (vaginal birth after two cesareans.) The National Institutes of Health, and the American College of Obstetricians and Gynecologists, stated in 2010 that a VBA2C was reasonable in “some” women. Go here for a great review of the research. Great list, thanks for sharing! I will be using this when I start interviewing providers to get my VBA2C. I am bringing this list to my next OB appointment! I don’t even know if another practice in the area even does VBACs but I would like to know their policies. I know they do them I just am not sure on their policies.